In March of 1962, I was a twelve-year-old Little League ball player bursting with excitement. Spring training for Major League Baseball was just getting started in Florida’s Grapefruit League; the New York Yankees were making Ft. Lauderdale their new spring training camp, and they would be playing ball in my hometown. 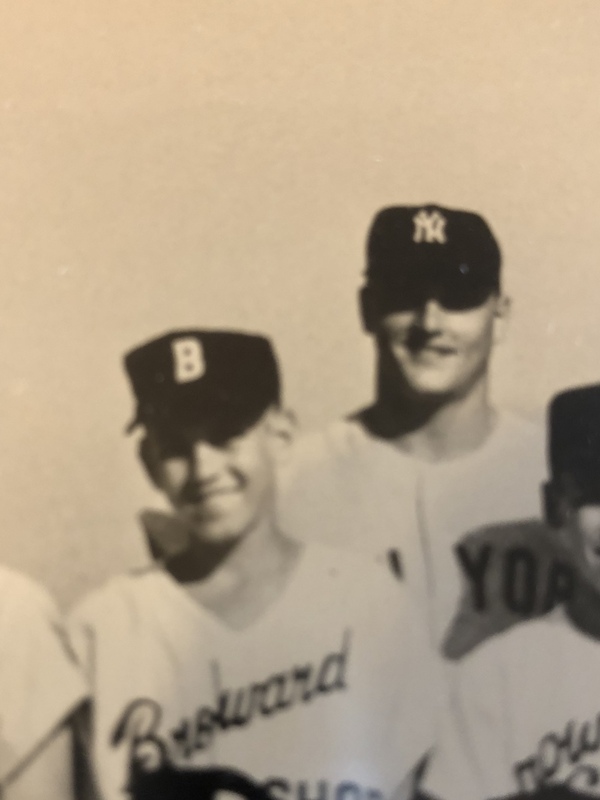 I not only lived and breathed baseball; I collected newspaper photos, box scores, and made a scrapbook in tribute to my home run hero, Yankees’ center fielder, Mickey Mantle. I also had a shoebox full of Topps penny bubble gum cards and my prize possessions were of number seven. At the time baseball cards were called bubble gum cards because each card came with a stick of hard bubble gum, but I wasn’t buying them for the bubble gum, I was always hoping for a Mickey card. The Mick and Roger Maris had just made history with their historic 1961 home run race that Roger eventually won, breaking Babe Ruth’s thirty-four-year-old record for most home runs in a single season. Roger had also been voted MVP in the American League two years in a row. But those accolades didn’t matter to me; Mickey was still my home run hero. With the Yankees’ playing in my hometown, what more could a young Southern Yankees’ fan ask for? How about finding myself changing into a baseball uniform in a locker room alongside Mickey Mantle and Roger Maris. 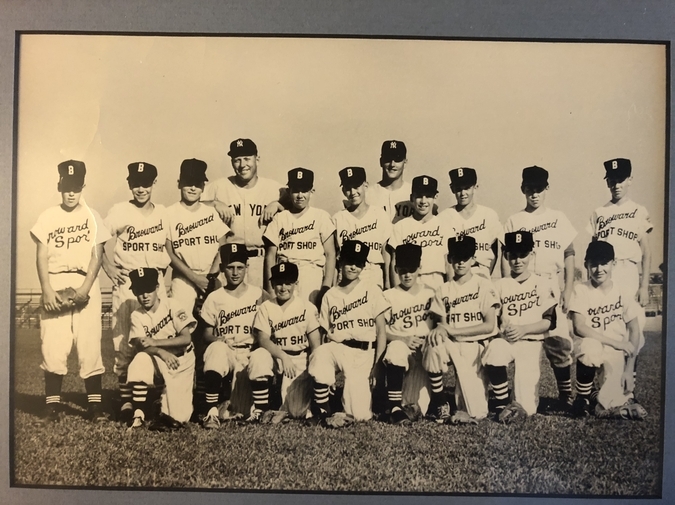 I was afforded this unique experience because I was one of two little leaguers from each city-sponsored baseball squad that was picked to be extras in a movie that was being filmed in Ft. Lauderdale about the two Yankees’ sluggers. The film was titled, Safe at Home, and it was about a little leaguer, who tells his teammates that he knows Roger and Mickey and he can get them to attend the annual Little League season-ending banquet. Of course, the boy didn't know them; so, to save face he makes his way to the Yankees’ spring training facility to meet the home run duo and ask them to attend. He manages to overcome many obstacles and the movie ends happily. But back to the locker room. I was terribly upset when the uniform jersey I was assigned for the film was number thirteen and was totally shocked when one of the other kids came up to me and asked if he could trade jerseys. I jumped at the chance, thinking any number would be better than unlucky thirteen. I was astonished when he handed me a jersey with the number seven on it. Mantle wore number seven. I remember thinkingis this guy crazy? I certainly didn’t say anything to him; I just took the seven and tossed him the thirteen. I still wonder to this day, why he gave up a number seven jersey? At the time, it didn’t matter. I was now changing into a number seven jersey at the same time “The Mick” was changing into his. As the filming of the movie progressed I got to know each man a little bit. It wasn’t like we were going to start up a correspondence, but I watched and admired them from afar. And during the first few days, my admiration for Roger grew to equal status with Mickey’s. Maris took the time to talk to me and the other little leaguers. Mantle was always kind but in a different way. Maris really held a conversation with all the young ball players. Mantle was just one of the guys. And by the time the little leaguers were finished filming, I became hooked on Maris. I still admired Mantle, but Maris became my new home run hero. I not only had a new home run hero, I also acquired autographed photos of both men, an official MLB baseball autographed by both of them, and my Wilson baseball glove was not only signed by the duo, but by the entire ‘61 Yankees squad, including; Tony Kubek, Clete Boyer, Bobby Richardson, Whitey Ford, Yogi Berra, Elston Howard, and Moose Skowron. Collectibles didn’t have the same value back then that they do today and when my mother gave my glove and baseball cards to the young boy that lived across the street and I gave the ball to my cousin, I didn’t think anything of it. The turmoil of the late sixties consumed my life. I managed to graduate from St. Cloud State (MN) University in 1972 with a degree in theatre, and when I found myself working in a very competitive world, baseball and home run heroes took a backseat to opening shows and getting good reviews. For the next eight years, my work was the most important thing in my life and although I was successful, I was not completely happy, something was missing. I found the cure to that problem in 1980 while working in Minneapolis through another theatre junkie who had found his peace in the Minnesota Twins. My happiness was rediscovered in baseball. I began to attend games at The Hubert H. Humphrey Metrodome and became a Minnesota Twins’ fan. Kirby Puckett and Kent Hrbek became my new home run heroes. I must admit when the Yankees came to town my loyalty to the Twins faltered. It was because of Roger and Mickey that my heart was still with those Bronx Bombers. And it was so easy to add Reggie Jackson to my home run hero list. I celebrated the Twins’ World Series Championships of ‘87 and ‘91 by having the “Homer Hankies,” given to fans at home games, framed. They proudly hang alongside the autographed photos of Roger and Mickey, the only mementos I still had from my youth, on the wall of my theatre office. The glove, cards, and ball were history. I began to buy Topps baseball cards once again and was disappointed that there wasn’t a stick of hard bubble gum in the package. I also discovered it wasn’t a penny a card anymore; it was $2.99 for a pack of five cards. Buying baseball memorabilia became an escape for me, and ESPN’sBaseball Tonight, especially the “Going, Going, Gone” segment, helped me leave my job at the theatre. When Mark McGwire and Sammy Sosa began their chase at Maris’ home run record in 1998, I came alive. It was very exciting and memories of the thirty-seven-year- old Maris and Mantle home run battle played out on the diamond in my mind, but secretly I didn’t want McGwire or Sosa to break the record. They were intruding on my M and M Boys’ memories. But I still followed the ’98 home run quest with the same baseball verve I had as a child. I got choked up the night (September 8, 1998) that the Maris children were in the stands at Busch Stadium when McGwire broke Roger’s record. And right before Big Mac hit the record-breaking home run, the children let McGwire hold the bat that their father had used to break the Babe’s home run record in 1961. Roger no longer held the record, but I had found another home run hero with the way McGwire handled the record breaking with dignity and class. The coincidence that Maris ended his career in St. Louis and McGwire was a Cardinal when he broke the record was very haunting. For the record, Sammy Sosa also broke Maris’ home run record that year, but Mark went on to best Sammy and become the home run champ with a total of 70 long balls. Sosa ended the season with 66. I began to collect McGwire memorabilia and made it a goal to go to Busch Stadium so I could say I saw both Maris and McGwire play. I finally attended a Cardinals’ game in 2001 and at last got to see McGwire play, but to my disappointment, Big Mac wasn’t in the starting lineup. He did make a plate appearance as a pinch-hitter in the ninth inning. I stood his entire at bat knowing I would see one of his trademark blasts that would land near the McDonald’s, Big Mac Land, in the left field seats. But alas, he didn’t hit the dinger I was hoping for, but I had fulfilled my goal of seeing my newest home run hero play. I also got to see another home run hitter play in that game in St. Louis. Albert Pujols’ MLB debut season was in 2001. That same year, Barry Bonds would go on to break McGwire’s three-year-old single-season home run record by going-yard 73 times. I was still celebrating McGwire’s feat that took thirty-seven years to accomplish, so I wasn’t ready to accept a new champ, but I couldn’t deny the facts. Barry was added to my hero list. Not long after that Cardinals’ game, I visited my daughter, who attended Concordia College in Moorhead, Minnesota, a twin city of Fargo, North Dakota, Maris’ hometown. My daughter knew I wanted to visit the Roger Maris Museum, his gravesite, and the monument built to him in Sportsman Park. We began with the museum. It is located in the West Acres Shopping Center and was loaded with artifacts from his professional and amateur playing days. The bat he hit his record-breaking 61sthome run, the same one McGwire handled before he hit the record-breaking 62ndwas there. His Yankees’ number nine jersey was on display. Along with his Indians, Athletics, and Cardinals uniforms. His three Sultan of Swat Crowns were under a portrait of the slugger. And there were various baseballs that had special meaning to him and also had special meaning to me, too. His gravesite at Holy Cross Cemetery brought a lump to my throat. The last time I saw this legend, I was a twelve-year-old boy. And now as a fifty-three-year-old man, I stood looking at his headstone, and I thanked him for being my hero. The monument was the last site we visited. It was a concrete structure and on it, there was an image of Maris in his classic home run swinging pose. It also listed each of the record-breaking home runs, the date it was hit, the park it was hit at, and the pitcher. When looking at a list of all sixty-one home runs, I realized just what a major accomplishment the feat was in the making. It was at the monument, where my daughter pulled from her purse the baseball signed by Roger and Mickey that I had given to my cousin in the 1960s. My aunt had discovered it tucked away in a forgotten drawer after forty years and slipped it to my daughter to give to me on my Maris quest. The ball was used and worn, the signatures were barely legible, but it now sits alongside the autographed photos and my McGwire memorabilia. And now fourteen years after my Maris’ pilgrimage to Fargo, and as I watched a new class of home run hitters like Ken Griffey, Jr., Jim Thome, Alex Rodriguez, Chipper Jones, David Ortiz, and Miguel Cabrera trade places at the top of the home run rooster, Roger Maris still remains my number one home run hero. Bob May holds an M. F. A. in Playwriting from The University of Nevada, Las Vegas. Twenty-five of his plays are published and have been produced around the world. Mr. May has taught in higher education since 1983 and currently teaches playwriting and screenwriting at The University of Central Arkansas. He and his wife, Cathy, have a blended family of five children and five grandchildren.